They say that Virginia is for lovers, and in the City of Portsmouth, there is much to love. With three centuries of historic neighborhoods nestled along the Chesapeake Bay, The City of Portsmouth is the type of community families love to visit, and that residents never want to leave. The municipal leaders in Portsmouth work hard to protect their community and their citizens and strive to give residents and visitors every opportunity to benefit from public service offerings and maximize all the City has to offer. In today’s world of digital-first communications and mobile device proliferation, a successful citizen engagement strategy has to focus on equitable and easy access to digital news, information, and resources, which is why the City of Portsmouth has long been committed to a digital content strategy that aims to ensure accessibility. With the latest updates to Section 508 of the Americans with Disabilities Act (ADA) raising awareness of accessibility compliance at the municipal level, the City of Portsmouth’s Information Technology (IT) leadership decided it was an opportunity for it to enhance its accessibility offering for even greater compliance. To take advantage of the latest innovations in digital accessibility, the City of Portsmouth turned to its website design and hosting partner, CivicPlus® for support. According to Daniel Jones, City of Portsmouth Chief Information Officer, while the City had always worked diligently to ensure its website was accessible to all citizens, the 2018 refresh of Section 508 of the ADA provided an opportunity for the City’s leaders to ask what else it could be doing to ensure accessibility. In the fall of 2017, CivicPlus partnered with AudioEye, Inc. to provide enhanced ADA-related digital accessibility capabilities to its local government website design clients that utilize its CivicEngage® content management system (CMS). AudioEye offers industry-leading software that enables public and private sector entities to make their content more consumable through technology. The AudioEye technology platform monitors websites as they grow, automatically fixing issues to ensure accessibility compliance using a range of assistive technology. Before integrating the AudioEye solution into its CivicEngage website, the City of Portsmouth’s digital administrators worked diligently to maintain digital compliance through a manual process of content management. While ongoing compliance became a City-wide goal, it has meant a continual commitment to content creation, updates, and optimization. Jones and his IT staff were primarily responsible for working with CivicPlus and AudioEye to implement the accessibility remediation solution. 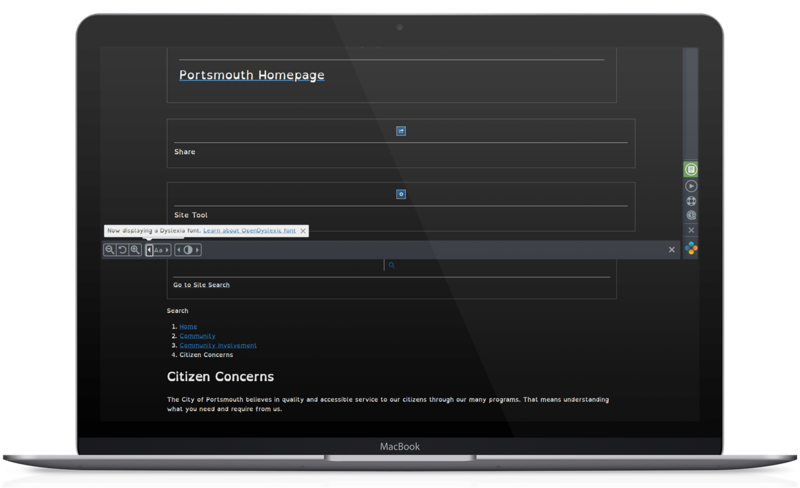 In addition to the implementation of AudioEye’s website monitoring functionality, the City of Portsmouth chose to implement AudioEye’s Ally Toolbar feature. The Ally Toolbar is a proprietary assistive tool that can be placed directly on a website, allowing users to customize their individual website experience. It offers users a wide range of assistive capabilities, including a dyslexic font, adjustments to color contrast, font size and navigation, keyboard controls, a player that will read site content aloud, and the ability to use voice commands to navigate. For the City of Portsmouth, improving its website’s accessibility is not about complying with laws and mandates. It is about doing what is best for the citizens it serves. Even with the implementation of the AudioEye solution, Jones and all of the digital content managers in the City of Portsmouth are not allowing their focus on accessibility to waver. Is your current website compliant with the latest requirements of WCAG 2.0 A and AA? Download our compliance checklist to determine opportunities to provide more equitable content to your citizens.